Get fit fast with this full body fat-burning HIIT workout. This circuit focuses on bodyweight moves to get the job done. As long as you have an exercise ball, you can do it at home, in the gym, or on the go. Try doing a headstand for an extra core challenge during the exercise ball leg raises. Workout by PumpUp member @jatie. Balance your upper body on your forearms and keep an exercise ball at your feet. Squeeze the exercise ball up until your body is extended into a full headstand. Lower your legs down with control and repeat. Modification: Lay flat on your back with your spine in a neutral position. Raise your legs toward the ceiling while squeezing the exercise ball with your feet. Slowly lower back down to the ground and repeat. Begin in a standing position, with your legs spread at a shoulder's width apart. Lower your glutes down to wards the floor, making sure that your knees don't extend past your feet. Push your legs back up to a standing position and repeat. Start in a raised plank, with the tops of your ankles balancing on the stability ball. Keep your upper body in the same position, brace your core, and use your lower abs to bring your knees towards your chest. Make sure that the stability ball follows through with your feet. Roll your legs back into a raised plank position, and lower your chest to the floor for a push-up. Repeat. Begin in a standing position, keeping your legs at a stance that is slightly wider than your shoulders. Lower your body down into a squat, jump your body upwards, and switch directions. 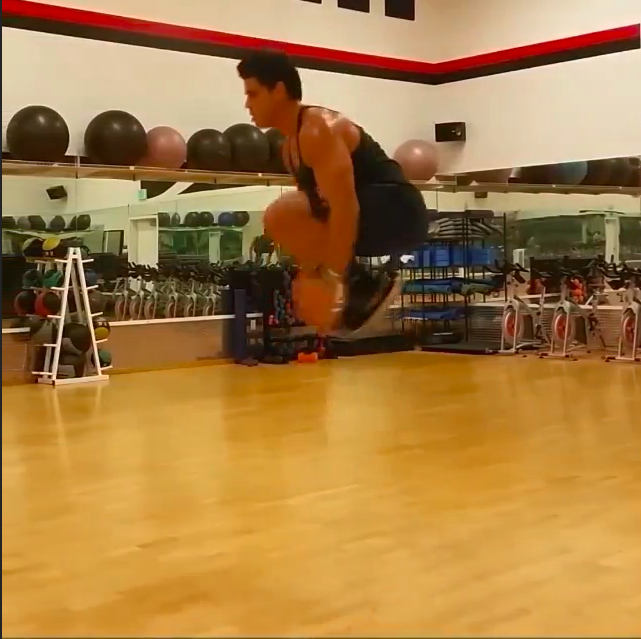 Repeat the squat and return to centre, then rotate your next jump to the opposite side. Repeat. Begin in a raise plank position. Lower your body towards the floor, bracing your core throughout the movement and keeping your elbows pressed towards your sides. Push your body up into a plank, hop your feet towards your chest, jump as high as you can while tucking your knees toward your chest, and hop your body back into a plank. Repeat. Perform each exercise for 30 seconds, with 20 seconds of rest in between each exercise. Rest for 1-2 minutes between each circuit. Repeat the full body fat-burning HIIT workout for two to three times more, or until 15 to 20 minutes have elapsed. Did you give this full body fat-burning HIIT workout a try? Pin it for later so that you can do it again! Let us know what your favorite bodyweight moves are in the comments below.